Click here to purchase an RBHS membership. Print out the Application for Membership and fill it out. 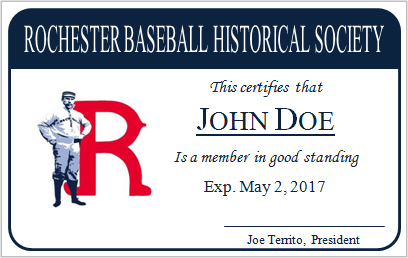 Include the application, along with a $25 check made out to Rochester Baseball Historical Society in an envelope. There are two membership cycles per year; the first cycle ends June 30th and the second cycle ends December 31st. Anyone who joins RBHS 1/1/2014 through 6/30/2014 will be a member through 6/30/2015. Anyone who joins 7/1/2014 through 12/31/2014 will be a member through 12/31/2015, etc.